How goes the battle for the Knights Templar, during the second season of the Knightfall TV show on History? As we all know, the Nielsen ratings typically play a big role in determining whether a TV show like Knightfall is cancelled or renewed for season three. Unfortunately, most of us do not live in Nielsen households. Because many viewers feel frustration when their viewing habits and opinions aren’t considered, we’d like to offer you the chance to rate all of the Knightfall season two episodes here. 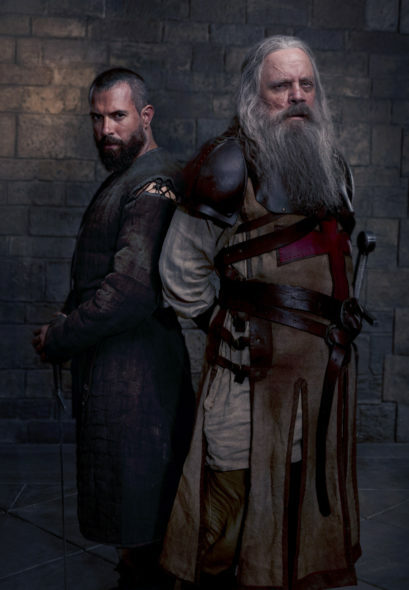 A History Middle Ages drama, Knightfall tells the story of the Knights Templar. Mark Hamill joins the History drama for season two, with Tom Cullen, Pádraic Delaney, Ed Stoppard, Simon Merrells, Julian Ovenden, and Jim Carter returning. Also new in the second season are Genevieve Gaunt, Tom Forbes, and Clementine Nicholson. The series explores the secret world of these warrior monks. With the downfall of the Templar Order looming, season two focuses on themes including power, redemption, revenge, betrayal, family, and an epic war between church and state.